There is a lot of blood and violence in London’s history. At one point in time, arguably the most famous killer in history, Jack the Ripper, prowled the city’s streets in search of new victims. Yet he is just one of the many ruthless criminals who lived (and killed) in London. If you are in Whitechapel and you fancy a pint, you can head on over to the Blind Beggar. The pub has a rich history and traces its origins to a centuries-old inn, but it is inexorably linked to London’s notorious mobsters, the Kray Twins. The Blind Beggar is the place where Ronnie Kray gunned down George Cornell in plain view. On March 9, 1966, Cornell went to the pub to have a drink. Some time later, Kray and an associate named John Barrie arrived at the Blind Beggar. Allegedly, Cornell only had time to sarcastically say “Well, just look who’s here” before Ronnie walked up to him, pulled out a 9mm Luger and shot him once in the forehead. Barrie fired a few warning shots into the ceiling before the two exited the pub and left in a car waiting outside. Spencer Perceval might not be among the most famous politicians in UK history, but he has the ignoble distinction of being the only British Prime Minister who was assassinated while in office. Born in 1762, Perceval became Prime Minister in 1809. His government faced a few crises such as the disastrous Walcheren Campaign to the Netherlands and the riots of the Luddites. On May 11, 1812, he was in the lobby of the House of Commons in London when he was approached by a man named John Bellingham who shot him fatally through the heart. Bellingham made little attempt to conceal his crime or escape. In fact, some accounts say that he went and sat back down in the same chair by the fireplace where he waited for the Prime Minister to arrive. Bellingham was a merchant who was falsely imprisoned in Russia. The British Embassy did nothing to help him and the government refused his request for compensation when he was released. He considered that he had “sufficient justification” for his actions. Bellingham’s defense team tried to argue that he was insane, but he was found guilty and hanged a week after Perceval’s death. The feud was somewhat rekindled in 1997 when two of their descendants, Roger Percival and Henry Bellingham, both politicians, battled for the same parliamentary seat representing North West Norfolk. Baby farming was a relatively common practice a hundred years ago which took place throughout Britain. People who had undesired, usually illegitimate children they didn’t want to raise would leave them with a baby farmer in exchange for money. This convention was rife with abuse. Once the baby farmers had the money there was little incentive for them to do the job they promised. They knew that most parents who used their service wanted nothing to do with their offspring and would never check up on them again. There are multiple cases where the children died from neglect and, in rare instances, even murder. At first glance, Amelia Sach offered a tantalizing service at her nursing home in Finchley, North London. People who brought their unwanted babies to Claymore House not only thought they would be looked after, but also adopted by wealthy families. However, the only thing those children received was an injection of chlorodyne, usually administered by Sach’s partner-in-crime Annie Walters. The murderous duo was caught in late 1902 when Walters’ landlord, also a policeman, became suspicious of his tenant’s activities. Police followed her and eventually caught her trying to dispose of a body. Walters soon implicated Sach and both were hanged on February 3, 1903. During the early 19th century, there was a keen interest in Britain in the study of anatomy. This created a huge demand for bodies for dissection. However, according to the law of the time, only the corpses of executed murderers could be used for this purpose. This led to the appearance of so-called resurrection men – body snatchers who dug up fresh corpses and sold them to medical schools willing to look the other way. Sometimes, these resurrection men didn’t want to wait around for people to die so they created their own bodies. The most infamous case is that of Burke and Hare, two men who killed 16 people in 1828 in Edinburgh and sold them for dissection. They were so infamous that the practice itself became known as burking. London had its own gang of burkers headed by John Bishop. In 1831, they tried to sell the corpse of a 14-year-old boy to the King’s College School of Anatomy. However, upon inspection, surgeon Richard Partridge noticed several disturbing characteristics: the body had never been buried, it was abnormally rigid, and had a cut on the head which bled onto the chest. He alerted the authorities and delayed the burkers until police arrived. Bishop and an accomplice named Thomas Williams were found guilty of the murder of the child who became simply known as “the Italian boy.” They confessed to drugging him with rum and laudanum and then drowning him in a well. They also admitted to doing the same thing to another boy and a homeless woman. They were hanged on December 5, 1831. On September 11, 1907 railway worker Bertram Shaw returned to his home in Camden Town to find the naked body of his wife, Emily Dimmock. She had been murdered and her throat slit from ear to ear. The violence of the crime made it a national story, but a twist revealed during the investigation turned it into a front page sensation. Unbeknownst to her husband, Emily worked as a prostitute named Phyllis. The husband was cleared of involvement, but this new detail suggested that one of her clients could be the murderer. Police arrested a glassware designer named Robert Wood (that’s him, pictured above). Emily was last seen alive in a pub in his presence and a postcard written by Wood suggested he was a customer. At trial, he admitted to being intimate with Dimmock, but denied any part in her murder. Wood was defended by formidable barrister Sir Edward Marshall Hall who got him acquitted. Other clients of Dimmock were investigated but they all had alibis and her murder remains a mystery to this day. Emily’s case was further publicized by artist Walter Sickert who did a group of four paintings based on the crime. He had previously done one on Jack the Ripper. In fact, a few modern ripperologists put Sickert forward as a suspect in the Ripper Murders. No trip through London’s seedy history would be complete without a stop at The Magdala in Hampstead. The pub might be closed now, but everyone still remembers it as the place where Ruth Ellis killed her lover and then became the last woman executed in Britain. The 28-year-old nightclub hostess was dating a racing driver named David Blakely. They had a fierce relationship which often became violent. Ruth had recently suffered a miscarriage after being punched in the stomach by Blakely. On April 10, 1955 Blakely went drinking at the Magdala with a friend named Clive Gunnell. Ellis waited for him outside the pub. When David came out, he initially ignored Ellis and walked right by her. That’s when she pulled out a Smith & Wesson and started firing. The first shot missed. The second hit Blakely in the back and he collapsed on the pavement. Ellis walked up to him and fired three more times at close range. She then stood next to the body in shock until an off-duty policeman arrived and arrested her. Her trial was short but sensational. Ruth sealed her fate during testimony when she said “It is obvious when I shot him I intended to kill him.” After a brief deliberation, the jury found her guilty and she was sentenced to death. 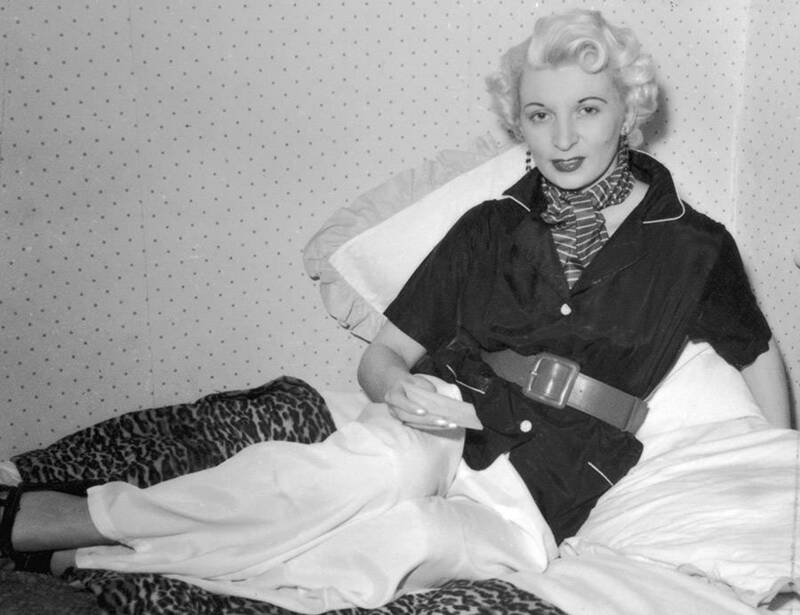 Ruth Ellis hanged on July 13. Dr. Crippen might be remembered as one of London’s most infamous murderers, but modern developments suggest he might not have been a killer at all. In 1910, Cora Crippen disappeared. Her husband was Hawley Harvey Crippen, a homeopath from Michigan. Initially, he claimed that Cora had died, but he later admitted to authorities that, in fact, his wife had left him and returned to America. Whether or not Scotland Yard believed his story is hard to say, but Crippen decided not to stick around and find out. He fled England and went to mainland Europe with his mistress, Ethel Le Neve. From there, the duo boarded the SS Montrose to Canada. While Crippen was on the run, police searched his home in Camden more thoroughly and found a human torso buried in the cellar. This turned the good doctor into the most notorious man in Britain. He was so well-known, in fact, that even in disguise he couldn’t travel without being recognized. Captain Henry George Kendall of the SS Montrose spotted Crippen and alerted Scotland Yard. They took a faster ship and arrested him before they reached Canada. The remains found in the cellar were badly decomposed, but were tentatively confirmed as belonging to Cora based on a piece of scar tissue consistent with her medical history. Crippen was found guilty and hanged on November 23. Almost a hundred years later, a forensic team from Michigan State University claimed mitochondrial DNA evidence indicated the remains belonged to a man. Their results have proven controversial and are yet to be widely accepted by the scientific community. Fifteen years before Jack the Ripper started his infamous killing spree, someone else was murdering women in London and cutting up their bodies. It became known as the Battersea Mystery because that was the area where police found the first piece of a dismembered corpse on September 5, 1873. Subsequent parts started showing up around the city until an almost complete body could be reconstructed. However, authorities were still unable to identify the victim. Despite a large reward of £200 and a promise of a free pardon for any accomplice, the case was never solved. A year later, another dismembered body was recovered from the Thames. This one also remains unidentified to this day and a link with the previous victim has never been established. Medical journal The Lancet published a detailed rundown of all the mutilations performed on the first body. They stressed that everything was done neatly and dexterously and nothing was hacked off. The skill on display showed that the perpetrator had medical knowledge. At the same time, the publication thoroughly dismissed the idea that the whole thing was a morbid hoax by medical students. In January 1911, the East End of London saw a massive gunfight between a combined police and army force and two Latvian revolutionaries. This shocking episode is known as the Siege of Sidney Street and is also notable for the presence of then-Home Secretary Winston Churchill. However, it was preceded by a much bloodier event which resulted in one of the largest losses of police life in the history of peacetime London. In December 1910, the gang of Latvians wanted to rob a jewelry store in Houndsditch. For this, they rented two properties which backed into the building. Their plan was to bring all the equipment they needed at the rentals and then break through the wall of the shop at night. The noise disturbed a neighbor who then alerted a constable named Piper. He investigated the scene and became immediately suspicious, so he left to get reinforcements. Six constables and sergeants returned at the rental buildings. They outnumbered the robbers, but the police were carrying truncheons while the criminals were armed with pistols. A fight ensued and five of the officers were shot. Sergeant Tucker died instantly while Sergeant Bentley and Constable Choate died in hospital. Two others were wounded, but survived. All of the robbers managed to escape. The investigation into the killings led to the aforementioned siege. How many people did Jack the Ripper kill? Five victims are typically ascribed to him, but there are plenty of people who think that Saucy Jack was far more prolific. There is another series of crimes which took place between 1887 and 1889 known as the Thames Torso Murders. Various parts of four dismembered women were found in the River Thames and the surrounding areas. Were these also the work of the Ripper or an equally-sadistic killer active at the same time? Officially, there is no evidence to suggest that the torso murders were committed by Jack. This was speculation from the newspapers as police considered them separate cases. Only one of the victims was ever identified – a prostitute named Elizabeth Jackson. Like the Battersea Mystery, there were some who thought this was just a medical school prank. This idea was dismissed as the bodies kept appearing. The medical men who examined the remains agreed that the killer had some practical knowledge of anatomy, but lacked the skill of a surgeon. They opined that he could be a butcher or a knacker. If the murderer was, indeed, a different person, then he had a longer and more gruesome killing spree than Jack. Even though he started first, it’s curious that he was still completely overshadowed by the Ripper.